[169 Pages] Report Adhesive Tapes Market was valued at USD 48.56 Billion in 2016 and is projected to reach USD 69.42 Billion by 2022, at a CAGR of 6.26% during the forecast period. In this study, 2016 has been considered as the base year, and the forecast period is between 2017 and 2022. The report aims at estimating the size and growth potential of the adhesive tapes market across different segments, such as resin type, technology, backing substrate, category, application, and region. 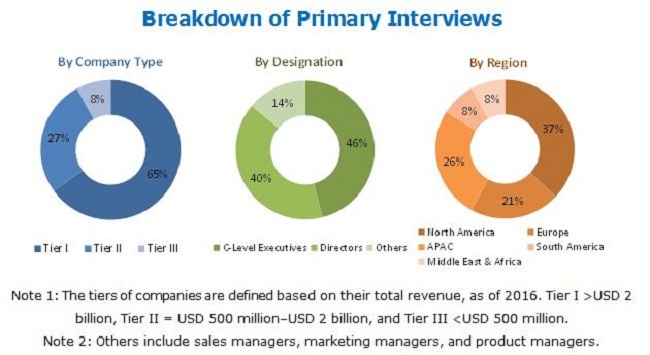 Factors such as drivers, restraints, opportunities, and industry-specific challenges influencing the growth of the adhesive tapes market have also been studied in this report. The report analyzes opportunities in the adhesive tapes market for stakeholders and presents a competitive landscape of the market. Both, top-down and bottom-up approaches have been used to estimate and validate the size of the adhesive tapes market and to estimate the sizes of various other dependent submarkets. This research study involved the extensive use of secondary sources, directories, and databases, such as D&B Hoovers, Bloomberg, Chemical Weekly, Factiva, and other government associations. Moreover, private websites and company websites have also been used to identify and collect information useful for this technical, market-oriented, and commercial study of the adhesive tapes market. After arriving at the total market size, the overall market has been split into several segments and subsegments. The figure given below provides a breakdown of primaries conducted during the research study, based on company type, designation, and region. 3M Company (US), Nitto Denko Corporation (Japan), Tesa SE (Germany), Lintec Corporation (Japan), Intertape Polymer Group, Inc. (Canada), Avery Dennison Corporation (US), Shurtape Technologies, LLC (US), and Scapa Group Plc (UK) are some of the key players operating in the adhesive tapes market. This research report categorizes the adhesive tapes market based on resin type, technology, backing substrate, category, application, and region. The adhesives tapes market is estimated to be USD 51.25 Billion in 2017 and is projected to reach USD 69.42 Billion by 2022, at a CAGR of 6.26% from 2017 to 2022. The increasing use of adhesives tapes in various applications, such as packaging, healthcare, electrical & electronics, building & construction, white goods, and automotive is driving the growth of the adhesives tapes market. The adhesives tapes market has been segmented on the basis of resin type, backing substrate, technology, category, application, and region. Based on resin type, the adhesives tapes market has been classified into acrylic, rubber, silicone, and others. Silicone-based adhesive tapes maintain adhesion over a large temperature range and possess the ability to adhere to difficult surfaces. The overall adhesive strength of silicone-based adhesive tapes is lower than that of other adhesive tapes. However, silicone-based adhesive tapes are more expensive as compared to acrylic and rubber-based adhesive tapes. Based on technology, the adhesives tapes market has been segmented into solvent-based, water-based, and hot-melt. The hot-melt segment is expected to grow at the highest CAGR during the forecast period. Hot-melt technology provides the advantage of high strength and immediate bond, which makes them ideal for a variety of applications, such as building & construction, automotive, white goods, and electrical & electronics. Benefits of using hot-melt technology include excellent adhesion, quick set and ease of use, and fast processing. Based on backing substrate, the adhesives tapes market has been segmented into Polypropylene, paper, Polyvinyl Chloride (PVC), and others. The paper segment is expected to grow at the highest CAGR during the forecast period. Paper is an environment-friendly and recyclable material. Properties of paper are enhanced due to saturation, which is a process wherein paper is treated with latex to improve its chemical and physical properties so that it can be used as a backing substrate in adhesive tapes. 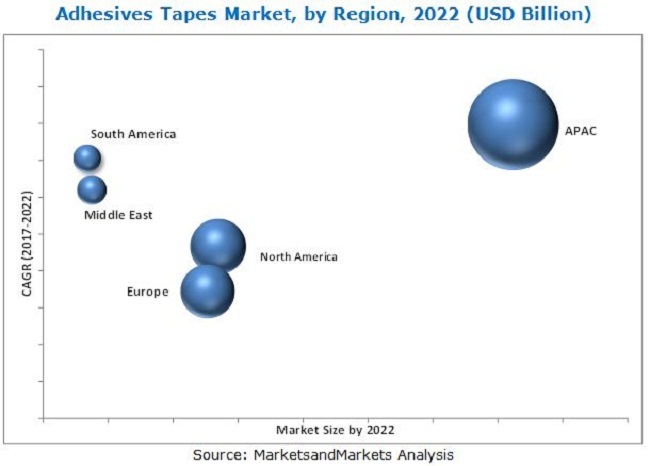 Based on application, the adhesives tapes market has been segmented into packaging, masking, consumer & office, healthcare, electrical & electronics, automotive, white goods, paper & printing, building & construction, retail, and others. The healthcare segment is expected to grow at the highest CAGR during the forecast period. In the healthcare industry, specialty tapes are applied on surgical containers, monitoring electrodes, and other medical devices. Currently, medical tapes are used in hospitals to cover wounds, for fixing cover shields during surgeries, and for cleaning purposes in antiseptic rooms. Adhesive tapes are also used in the manufacture of disposable infant diapers and adult incontinence products. The adhesives tapes market in the Asia Pacific region is expected to grow at the highest CAGR during the forecast period. The rising demand for adhesives tapes from countries, such as India, China, South Korea, Vietnam, Taiwan, and Singapore, is projected to drive the growth of the adhesives tapes market in the Asia Pacific region. China is expected to lead the demand for adhesives tapes in the Asia Pacific region. Volatile prices of raw materials are acting as a restraint to the growth of the adhesive tapes market. Natural rubber, films, foams, paper/PP/PVC, and release liners are raw materials used in the manufacture of adhesive tapes. Most of these raw materials are petroleum-based derivatives that are vulnerable to fluctuations in commodity prices. Key players operating in the adhesives tapes markets include 3M Company (US), Nitto Denko Corporation (Japan), Tesa SE (Germany), Lintec Corporation (Japan), Intertape Polymer Group, Inc. (Canada), Avery Dennison Corporation (US), Shurtape Technologies, LLC (US), and Scapa Group Plc (UK). 13.6 Intertape Polymer Group, Inc.
13.11.11 Canadian Technical Tape Ltd.
13.11.14 Industrias Tuk, S.A. De C.V.